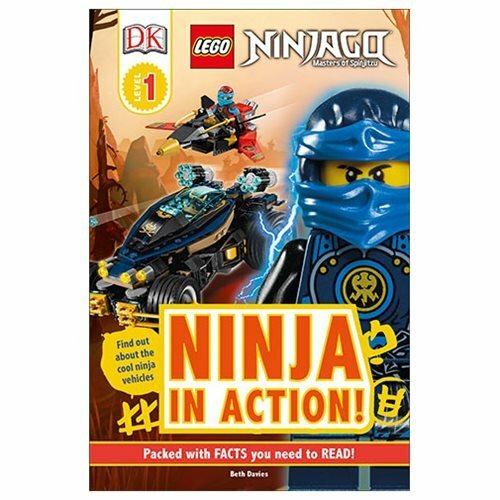 Join the Ninja as they speed through the high-tech Ninjago world on bikes, jets, mechs, and even dragons in the LEGO Ninjago Ninja in Action DK Readers 1 Hardcover Book! Read about how the brave heroes step aboard awesome vehicles and defeat their enemies. This Level 1 book is illustrated with LEGO Ninjago sets, and has true kid appeal. Narrative spreads are supported with captions and annotations, plus a quiz, to encourage children to develop comprehension skills. Race into battle with the LEGO Ninjago heroes. The 24 page hardcover book measures about 9 3/10-inches tall x 6 1/5-inches wide.